3M Glass Bubbles S32HS breaks the density barrier in SMCs at <1.0 g/cc, enabling the potential to replace metal components. 3M™ Glass Bubbles S32HS enables first-ever, ultra lightweight sheet molded composites with Class A paintable surfaces for automotive manufacturers. ORLANDO--(BUSINESS WIRE)--National Plastics Expo, Booth #S27153 – As automotive manufacturers look to improve fuel economy and battery range for electrification, material lightweighting without compromising mechanical integrity is vital. Metals, although lightweight, can come with indirect processing and manufacturing costs and may become even more expensive with the uncertainty surrounding global metal supply. Sheet molded composites (SMCs) are a viable alternative to metals in certain applications, while still achieving the desired physical properties. 3M today introduces Glass Bubbles S32HS to help OEMs achieve up to a 40 percent weight reduction of composite parts, at a density below 1.0 g/cc, while still enabling a class A paintable finish. This innovation makes SMCs an attractive option in automotive design for OEMs. For many years, 3M has partnered with the automotive industry to enable weight reductions for major automotive manufacturers. By replacing conventional fillers, these hollow glass microspheres can reduce the weight of molded parts without sacrificing strength or aesthetics. For the first time, 3M has been able to break the density barrier, making ultra lightweight SMCs more competitive to steel and aluminum, opening up new possibilities for the material mix in automotive applications. 3M glass bubbles are an established lightweighting technology used in enabling lightweight sealants, injection molded parts and SMCs. 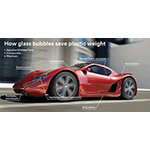 3M continues to be at the forefront of automotive lightweight material innovation with the launch of Glass Bubbles S32HS. To learn more about lightweighting SMCs, please visit 3M.com/SMC or to learn more about 3M Automotive Lightweighting Solutions, please visit 3M.com/AutoLightweighting. All other trademarks listed herein are owned by their respective companies. At 3M, we apply science in collaborative ways to improve lives daily. With $32 billion in sales, our 91,000 employees connect with customers all around the world. Learn more about 3M’s creative solutions to the world’s problems at www.3M.com or on Twitter @3M or @3MNews.